Mods are a popular and free add-on feature for your personal World of Tanks installation. 1 Game Modifications, a.k.a. "Mods"
3 The eXtended Visualisation Mod or "XVM"
WoT game Mods may be created by Indie developers, WoT players, history buffs, or anyone with a cool idea who takes the time to learn how to create them. Mods are posted by the creator to EU, NA, RU, Asia, and other WoT server forums, or to websites specializing in serving up pc gaming Mods, and are available there for download. A Google search should net you plenty of links. Mods installed on your computer are "client-side" and are visible only to the player on the computer on which the Mod is installed. Many different Mods may be installed and working at the same time. However, there can be "conflicts" between two or more Mods resulting in incompatibility issues which cause crashes or glitches. It is advisable to install new Mods one at a time and to test their functionality through the replay system or a test battle after each installation to insure that all modifications are working together as desired. The main WoT game directory has a special sub-folder named res_mods. This folder is where Mods are installed, in a subdirectory named, res_mods/0.X.Y, where 0.X.Y is the most recent WoT patch version number. The active Mod directory name therefore changes with each WoT version patch. Typically, each Mod will require update and modification to make it compatible with the latest patch. Instructions for installing into the res_mods/0.X.Y are usually included as a readme.txt file with each Mod or are presented at the download site. Un-installing the Mod is as simple as deleting the files pertaining to it from res_mods/0.X.Y and any applicable sub-directories.Backup copies of the res_mod directory before and after a successful installation are always a good idea. Many Mods may be further customized by each user to suit his or her own personal preferences. Modification usually takes place by using a text editor to modify a few characters of HTML text in a specific .xml or .xc companion file with the Mod. 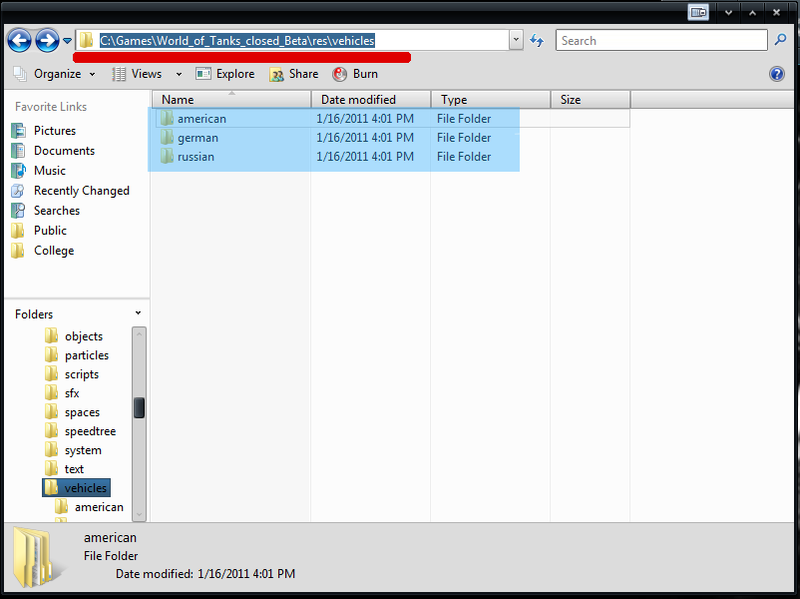 These companion files contain configuration commands for the Mod. User tweakable configuration may involve color changes, icon choices, or other Mod attributes. Instructions for available tweaks are usually described in the Mod's readme.txt file. World of Tanks has produced a video summary of mods. Mods often become so popular that they, or something very similar to them, are actually incorporated into the game in a later patch. There are thousands of Mods available for download, and a Mod can generally be classified into one of the following 6 classifications or as an XVM Mod. Vehicles: Somewhere there is a 'Skin' Mod for every vehicle in the game. Skins change the appearance of a vehicle in-game, on the battle interface screen and in your garage - but only for you to see, they are not visible by any other play in battle (unless they have the same skin mod installed). Skins range from the whimsical, such as the Tiger tank skinned as an anime pussycat or the fast BT-2 light tank skinned in Ferrari livery, to the historically accurate that show detailed camo, battle damage, and (for example) unit insignia of Monty's Desert Rats. Hitzones: Additionally, there are hitzone Skins with coloured areas for each particular vehicle to identify vulnerabilities or weak spots (warning - some of these are 'banned' on the NA server). Dead-tank skins make the hulk appear as white or grey to increase visibility. Content: There are helpful skins for certain game content, like the must-have skin to make yellow caution markings appear on the sides of all railway flat cars to make them more visible in battle and avoid high speed collisions. A range of mods are available to enhance, complement, or replace the in-game music, gun reports, battle ambiance, or engine sounds. Other Audio Mods are custom compilations that change the voice messages heard from the WoT in-game "tank commander" with other voices. Some are familiar voices and some are vulgar, clipped from movies or other popular video games. Some add an audible warning to the Sixth Sense perk's visual one. These provide customized gun sights and the 'camera view' perspective. These Mods may offer a choice of sight reticule (ie cross-hairs) designs, alternative reticules or aim-point markers, countdown timers for gun reload or arty shell travel time, extra zoom in for sniper mode or extra zoom out for a birds-eye view in arcade mode. Mods that display the limits of gun free-travel (before moving the gun further causes the hull of the SPG or turretless TD to also move, potentially disclosing your location to the enemy) are also in this category. These are all popular mods. Change the appearance of the default damage panel in the lower left corner of the battle interface. Some move its position, change its appearance and/or add additional information such as a log of hits received with amounts of damage per hit. Some include additional visible and audible warnings for vehicle fire. Are also popular Mod choice. They replace the small grey-colored contour silhouette icons unique to each in-game vehicle. Contour icons are displayed in the player's panel in battle, the battle loading screen, and other places, including Over Target Markers, where the default WoT contour icon would otherwise be used. A variety of contour icon Mods and range from the simple to the colorful to the complex. Some CI Mods are easy to read at-a-glance in battle and are color coded to vehicle type, TD, HT, SPG, etc. Some contain elaborate additional information on armor thickness or hit-points. Others display flags and symbols of the nation. A large range of choice is available for you to customise the appearance of your garage, service record, barracks, or techtree. There are Mods to customize the appearance of the garage into a theme, or to provide the vehicle selection carousel with two or more rows instead of one (very useful when you have a large number of tanks), sort your tanks by tier, type, nation, and even to change the horizontal techtree back to the 'old style' vertical format. The eXtended Visualisation Mod or "XVM"
May be customized in almost any style or configuration with a wide range of icons and information; and if the separate XVM Statistics Module is also installed, all of the statistical information available therefrom may also be displayed. Is a list of individual hits placed on a named enemy target with the amount of hit point damage caused with a running accumulated total of hits and damage caused and/or a list of individual hits received by the players vehicle with the amount of hit point damage recieved with a running accumulated total of hits and damage received. The Hit Log can be configured to show a wide selection of information. Permits extensive customization of the content, presentation, and characteristics of the in-battle MiniMap. Custom icons can be selected and each annotated with vehicle name or player name. View range circles, hull direction pointer line, gun muzzle pointer line, and gun constraints lines can be included on the MiniMap and their color and line type changed to suit. A last known position feature can be enabled that shows where no longer visible enemies were last seen. The XVM Mod also provides functionality to customize base capture indicators, in battle player panels, battle loading player panels, sixth sense icons, and the ability to utilize Clan Logos and other icons and images in the Vehicle Markers and Player Panels. XVM Clan Icon sets are updated periodically and are available on a per server basis, for download at Clan Icons. Supporting documentation is included in the XVM Mod download describing how to customize and change the configuration of your XVM Mod to suit your personal preferences. There is wide use of XVM by players, however there are a number who feel its use is unfair. The information it provides can be used to assist with tactical decisions within the game. It is information that is not provided by the basic client and it is not available to all players unless they use XVM. Only those players who download and use XVM have access to this extended information. Players may use XVM at their own risk, but it may restrict their development as players if they become over reliant on XVM. Mod Packs are compilations of compatible Mods or XVM Mod configuration which were compiled and custom configured to work together by a compiler person and are often good choices for those who do not wish to take the time to customize their own. Mod Packs are useful for newcomers wanting a quick step into battle with the latest Mods. Mod Packs themselves can be further customized and personalized if required. About Fair Play Policy you can read the official . There is a great community with many people who enjoy creating skins for tanks. Be careful what you download. If you don’t trust the source, don’t download the package. In all cases make sure you have a good protection suite on your computer! The current version of the WoT client is v0.9.19.1, the release date is not sure because the version is still in Common Test. Version 0.9.11 was skipped out of sensitivity to the Sept. 11, 2001 attacks. The client file structure requires that all mods be re-installed after every number release, e.g. when 0.9.12 replaced 0.9.10 . Some of the mods don't require coding update for new client versions, others do. The WoT forum has a lively section dedicated to mods, with new posts as mods and modpacks are updated to each new version. WoTHelp World of Tanks 9.9 Mods. This has not been re-created for 0.9.12, but in many cases following the link to the mod's download page you will find that the link on the page has been updated to the current usable version. Once you replace a file, there is no way to get it back unless you have a backup or reinstall the client from scratch, so make backups first, always. Here is the file location for all the tank skins, they are then broken down into parent directories that house each nations tank skins and models. Now locate the tank that you will be adding a custom skin to. 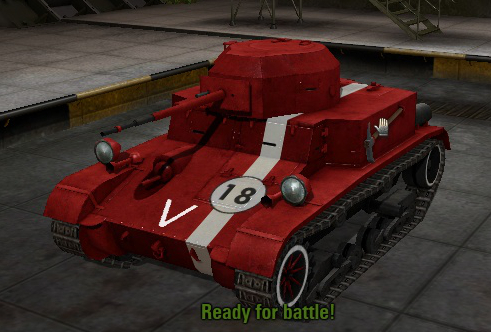 In this guide we will be adding a custom skin to our T2 Light tank, which is called A19_T2_lt by the game directory. 1st select the main folder for that tank. Click on the folder, then drag the folder up between any two folders until you see a long black line appear, this means you are placing the folder between these two entries. Press and hold the "Ctrl" key, a message should come up that says "Copy to (nationality)". While holding "Ctrl" release the mouse button. This will create a duplicate copy of your tanks info. 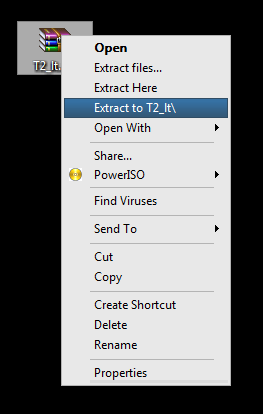 If done correctly, you should have a folder with two A19_T2_lt folders, but one should now have "Copy" at the end of the folder name. 1: Now click on the link for file you want to download. 2: Click the download button. 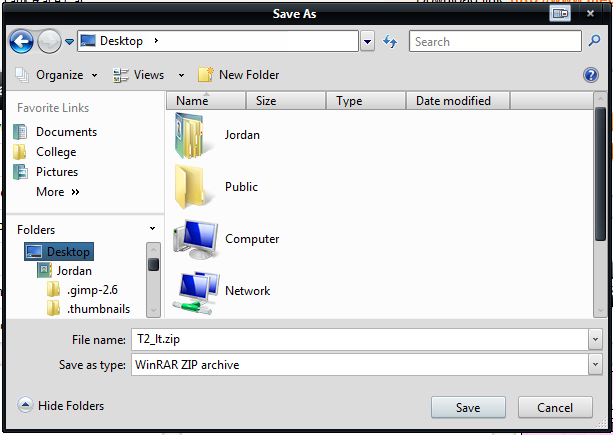 4: Select where you want the file to be downloaded, generally I pick the desktop since it is easy to locate and easier to transfer files out of. 5: A file like this should appear on your desktop. Generally they are either .zip or .rar, the process will be the same for either file type. 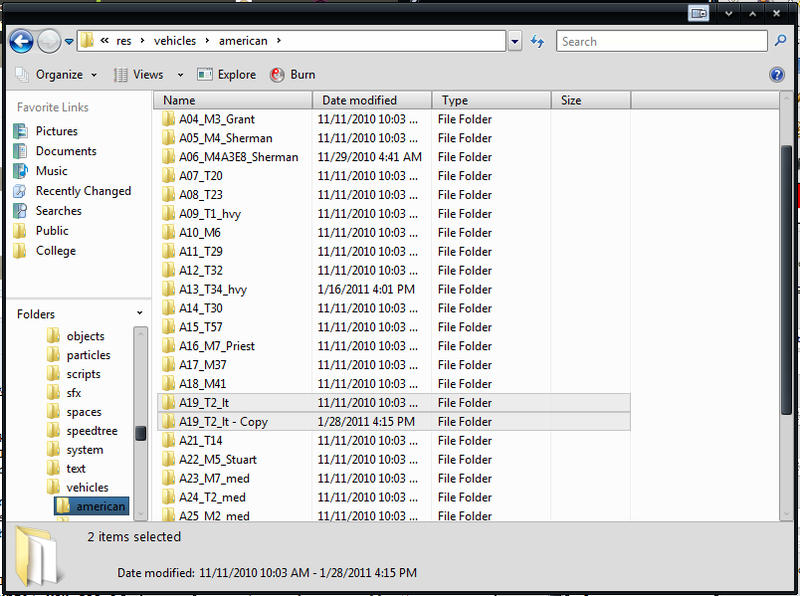 Right click and select, "Extract to [file name]" This will extract the files into a folder that you can browse through. 6: Click on the new folder that was created on your desktop. It should contain some files; tank_name.dds, tank_name_crash.dds, some images. It may contain alot of files, or it may contain just one. 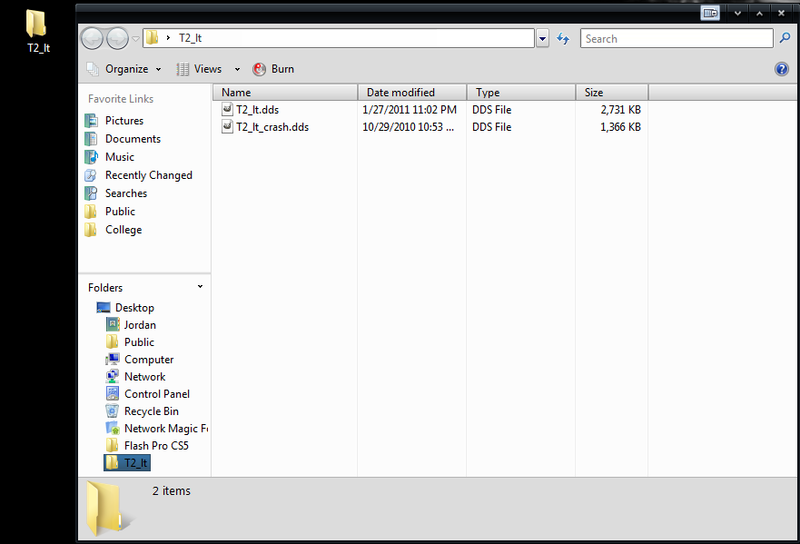 7: Select the files from this folder and move them into the World of Tanks folder. For me it was both T2_lt.dds and T2_lt_crash.dds into A19_T2_lt. 8: A dialog box should appear. 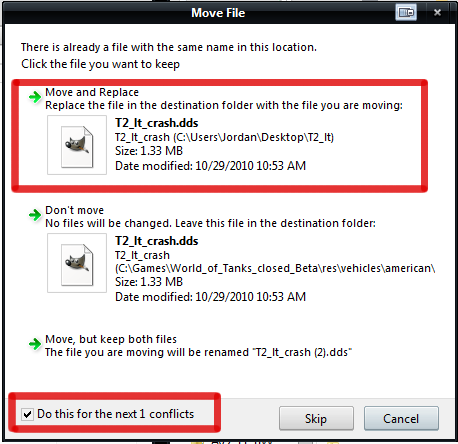 Check the box that says "Do this for the next # conflicts" and then press "Move and Replace"
Make sure that you are copying to the right folder and not into your backup folder. Q: Can everyone see my new cool skin? A: No, the files are held on your computer and only rendered by your computer, thus only you can see them. Q: Is this skin only for the tank I am driving? A: Again, skins are held on your computer and are applied to all the tanks it pertains to and rendered just on your computer, so all tanks will look like yours. Q: Can I make my tank harder to spot with new skins? A: No, skins are just aesthetic, while spotting is just an algorithm. Q: Can I put offensive things on my tank? 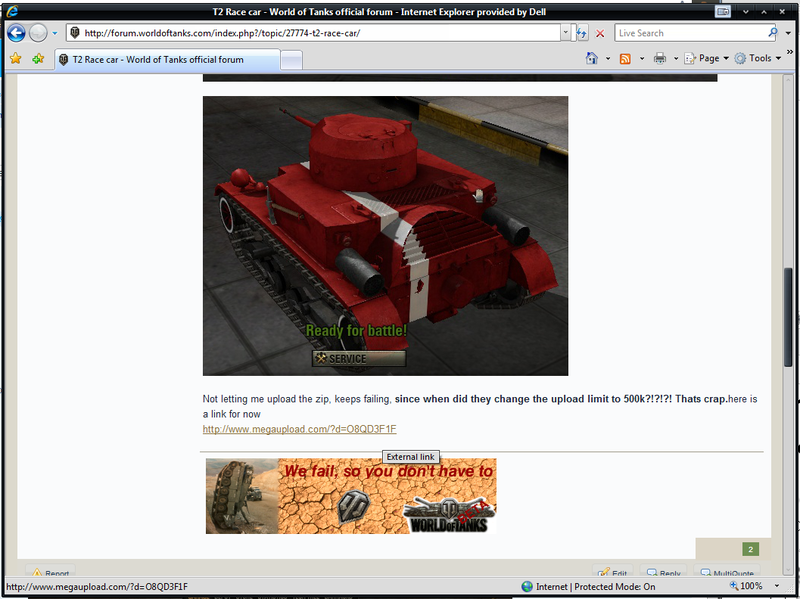 A: Yes, but you can't post images of your tank or skin on WoT forums. Just a Very basic camo method I(Conkker) use. If you're familiar with Photoshop you should be able to edit and change it from here. Using [These] can help make the skin look more authentic. Warning, Massive Image. Make sure to make a backup copy of all the .dds files before editing. If you plan on making your own skins, these cut-outs will help you make them look good. This page was last modified on 7 January 2019, at 01:28. This page has been accessed 768,337 times.